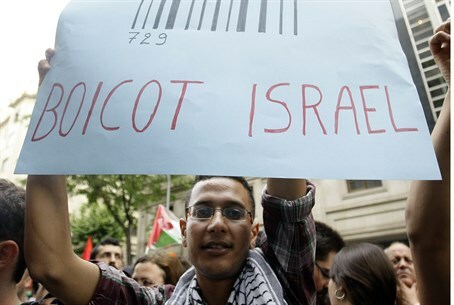 Panel at Conference of Presidents on BDS examines boycotts from every angle. The Boycott, Divestment, and Sanctions (BDS) movement remains a hot topic at the Conference for Presidents of Major American Organizations in Jerusalem Monday. In a panel entitled "In the Middle of the Middle East Volcano: Prospects and Problems," three major experts - Dr. Tal Becker, Deputy Legal Advisor to the Ministry of Foreign Affairs; Brigadier General (res.) Michael Herzog, Senior Fellow, Jewish People Policy Planning Institute; and Brigadier General (res.) Yossi Kuperwasser, Director General in the Ministry of Strategic Affairs - tackled the boycott issue and its impact on world Jewry. Dr. Becker's approach to the boycott phenomenon focused on a theory that the traditional concept of 'hasbara,' or explaining why popular perceptions of the Israeli-Arab conflict are incorrect, sometimes is not an efficient deterrent to anti-Israel sentiments. "Part of the approach of the delegitimizers is to have many little lies and then it builds up into a big lie and a narrative," Dr. Becker explained. "There are some audiences for which trying to correct them on the facts doesn't work. While the concept of 'hasbara,' of correcting the facts is very important [. . .] there are some people for whom when you say 'hasbara,' when you say 'I am going to correct you about this issue,' you've lost them completely." The problem with hasbara, according to Dr. Becker, is that the technique of explaining away the issues often gives an impression of being patronizing. While in some cases that may well be correct, Dr. Becker holds that the approach has the potential to alienate people who may otherwise run to pro-Palestinian sources for information. "Some people are resistant to facts, no matter how compelling they are," Dr. Becker continued. He proposed a second model of combating delegitimization: not by running off the facts - which is typical hasbara - but by citing values. "The difference I would make is between being an advocate for Israel and between being a character witness for Israel," he explained. "An advocate for Israel is someone who has the arguments in front of them to make the case. And very often, the fact that you have 'advocate' written on your forehead means that someone is not gonna listen to you." "A character witness says: 'you know what, I know those Israelis," he continued. "'Now you know what, they may not get it right every time. But I've met them, I've spoken to them about the dilemmas that that country faces, and I know that they can bring to those dilemmas values that the Western world shares." "Connect to people on the level of their values and their emotions before you connect to them at the level of fact," he summarized. Brig. Gen. Kuperwasser approached the problem as a general phenomenon. "We are under attack from a group of organizations who want to question our legitimacy and weaken our capabilities to defend ourselves," Kuperwasser noted. To combat them, he explained, "we formed a group called Global Coalition for Israel – loose structure to better synthesize and coordinate our efforts"
"It is not by coincidence that the issue [of recognizing Israel as a jewish state] is on the table [ in the peace negotiations and the BDS campaigns]," he stated. "That is why it is important to set the record straight, it is about israel's right to exist as a jewish state." Kuperwasser also assured the audience that in the meanwhile, the ongoing boycott threats from Europe will not affect Israel's security or policies. "Israel is not going to change its policy on the peace process because of all kinds of threats to our economy," he stated. Brig. Gen. Herzog noted that the widespread acceptance of BDS is due to globalization - and that it's a factor that can be used to Israel's advantage, as well. "[BDS] is a global phenomenon, potentially every citizen is a soldier in this war," Herzog theorized. "We can also use this as a global phenomenon to fight back."